Côte d’Ivoire is gradually recovering from its decade of conflict and life is becoming more stable again. But in Abidjan thousands of children continue to lose the care of their parents due to HIV/AIDS and other difficult economic and psychosocial factors. Abidjan was the capital of Côte d’Ivoire until 1983 and remains the country’s largest city, with a population of over five million in its metropolitan area. It is also the country’s most important industrial, commercial and political centre. In recent years, the city has seen quite a steep population increase, in part due to the internal displacement of thousands of families during the war, as well as the influx of rural migrants who come to the city in search of employment. In tandem with the growing population, poverty levels have also been on the rise. Abidjan is a city of contrasts where wealth and desperate poverty are often found side by side. Abobo, the part of the city where the SOS Children’s Village is located, is very densely populated and has traditionally been an area settled by migrants, with little urban planning and not much infrastructure or many social services in place. An estimated 20 per cent of Abidjan’s population lives in slums. In total, only between ten and 35 per cent of the population is connected to the sanitation system, and those who are live in the wealthier districts. This means that in many areas faecal waste is not hygienically disposed of and clean drinking water is not always available. This situation can severely impact children’s health and general development, as they are most vulnerable to sanitation-related illnesses. To make matters worse, Abidjan has a tropical monsoon climate which gives rise to frequent and severe flooding. Côte d’Ivoire continues to be the West African country most severely affected by the HIV/AIDS epidemic. 6.4 per cent of women and 2.9 per cent of men are infected – in part this feminization of the disease is due to the increased sexual violence that took place during and after the war. Girls are also vulnerable to infection when female genital mutilation is carried out. The country’s National Strategic Plan has brought many improvements in terms of prevention, treatment and care. However, as of 2009 there were 450,000 people living with HIV in the country, 63,000 of them children under the age of 14. In addition, there are 440,000 children who had been orphaned by the disease. 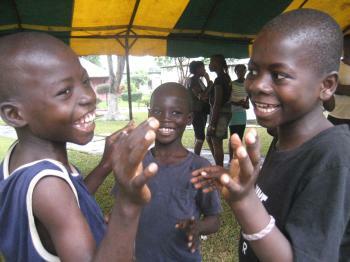 SOS Children’s Village Abobo-Gare was the very first children’s village in Africa and opened its doors in 1969. Over the decades, the nature of our work in Côte d'Ivoire has varied. In recent years, there was a growing need for support within the community as poverty levels were on the rise. The SOS Family Strengthening Programme, which we offer at our social centres, includes initiatives such as HIV/AIDS awareness campaigns in the surrounding communities, assistance for HIV/AIDS-affected people by providing food, medicine, school scholarships, single donations, and support with setting up self-help projects. All efforts aim to maintain family stability and alleviate hardship so that children have a secure home and will not be abandoned. 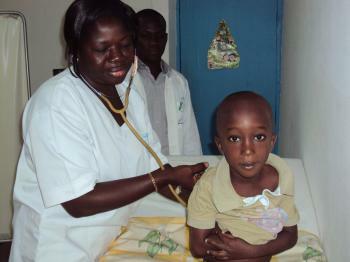 The SOS Medical Centre in Abobo-Gare is also open to the community and serves around 3,000 local people. It is run as an outpatient clinic where people receive basic medical care and treatment according to their needs. Care in families: For children from the region who can no longer live with their parents, SOS families and foster families can provide a loving home. Some families live in homes in the local community. The families receive the same support from SOS Children’s Villages. Living in the community gives children the chance to develop closer relationships with new neighbours and friends. Education: Children can attend the SOS Kindergarten. The children then go on to complete their primary education at the SOS Hermann Gmeiner School, which is attended by over 200 pupils. Support for young people: When young people from the children’s village reach an age where they are ready to move out of the family home, the SOS Youth Programme makes shared accommodation available. Qualified SOS co-workers accompany and support the young people on their journey to becoming independent adults, for example by providing guidance and support in finding employment or training opportunities.